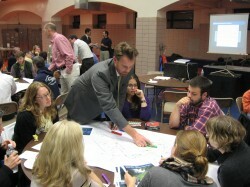 Thanks to everyone who has participated so far in Round 2 of the NYC DOT Brooklyn Waterfront Greenway planning workshops! Over the past three weeks, we’ve had well-attended and productive meetings at Borough Hall in Downtown Brooklyn, St. Michael’s Church in Sunset Park, and Red Hook Recreation Center (photo below). We’ll close out this set of workshops on Thursday, October 21st at Brooklyn Brewery in Williamsburg. If you have not yet RSVPd, you can do so at brooklynwaterfrontgreenway@dot.nyc.gov.